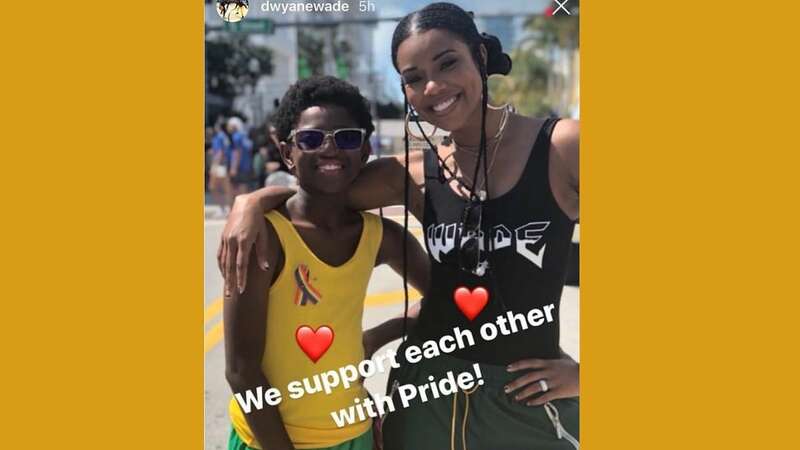 Over the weekend it was a source of pride and joy for Gabrielle Union and the rest of the Wade family who went full throttle with their support of 11-year-old Zion as the family joined in on the festivities at the Pride Festival in Miami Beach. Both Union and her husband, Miami Heat star Dwyane Wade took to social media to post pics of Union posing with Zion enjoying the celebration. Zion is Wade’s son by his first marriage. It was all big smiles at the gay pride fest and the whole family was right there, except dad, who had a game in Toronto, to offer their love and solidarity with Zion, who was proudly wearing a rainbow ribbon. “Zion had his own cheering section today. Wish I was there to see you smile kid,” Wade wrote on his Instagram story. “We support each other with Pride,” Wade captioned the video featured Zion and his wife. < o in attendance was older brother Zaire, 17, and baby sister, the adorable “shady baby” Kaavia. The LGBTQ pride festival draws some 145,000-plus people to the South Beach area annually. The messages by the Wades also activated an outpouring of online support. “Seeing Dwayne Wade and Gabrielle Union support Zion at Miami Pride is just so beautiful! Parenting done right. Much love to them. So inspiring,” wrote another user. Seeing Dwayne Wade and Gabrielle Union support Zion at Miami Pride is just so beautiful! Parenting done right. Much love to them. So inspiring. Others reminded the Twitterverse that no hate toward Zion would be tolerated.